Distinguishing Characteristics: African-American male. Black hair, brown eyes. Trimble's nickname is Zero. Clothing/Jewelry Description: A blue shirt and Nike shorts. 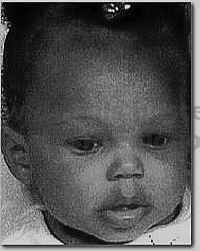 Trimble was last seen at his residence in Wetumpka, Alabama at approximately midnight on October 8, 2007. He was accompanied Joey Dale Ward, described as a 27-year-old White male. A photograph of Ward is posted below this case summary. The men were traveling in a blue and tan 1987 Ford F-150 pickup truck. Trimble has never been heard from again, and Ward disappeared about a week after Trimble did and has yet to be located. Ward has active warrants out for his arrest on charges of burglary and theft. Authorities believe foul play is possible in his case, as it is uncharacteristic of him to leave without warning. Trimble is a military veteran. He is married, has three children and was unemployed at the time he went missing. His disappearance remains unsolved.